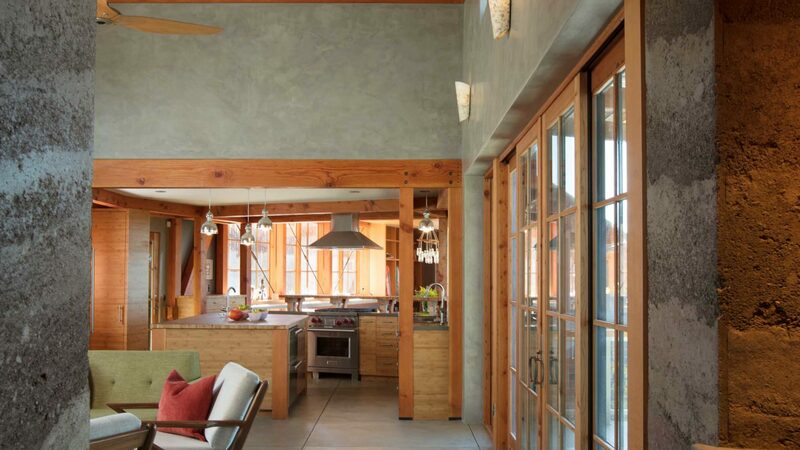 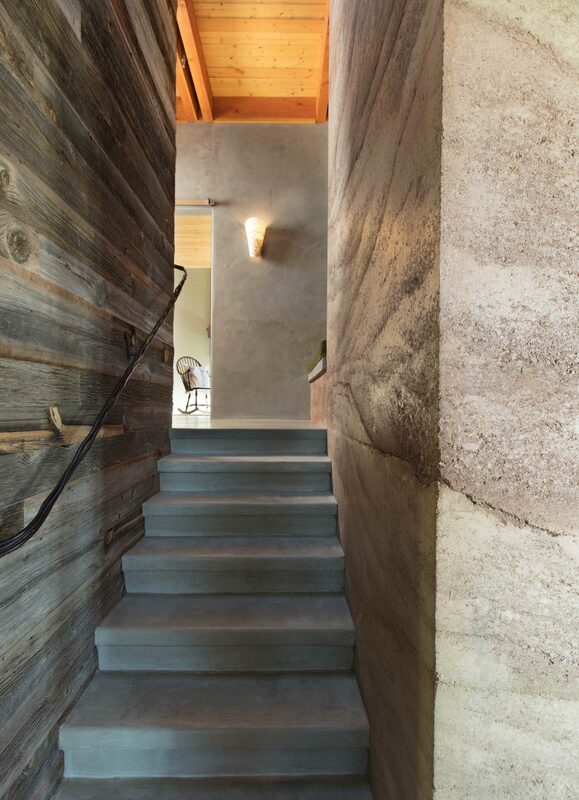 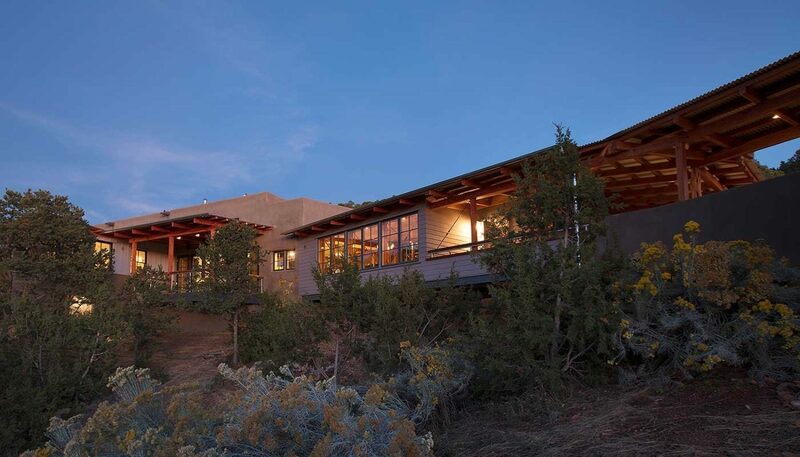 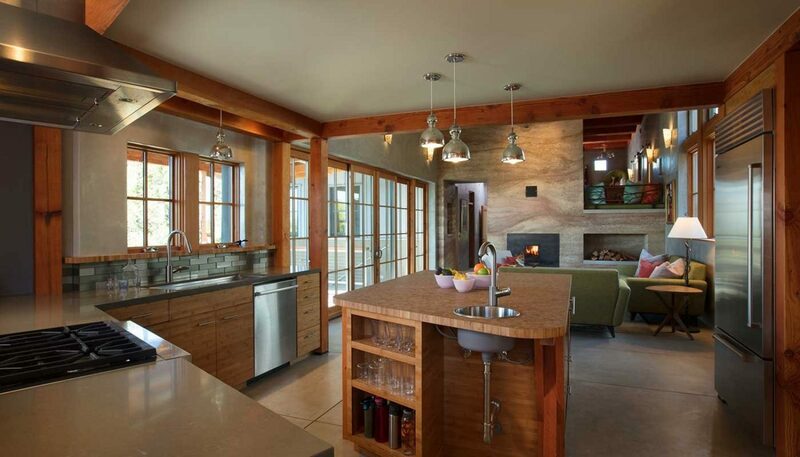 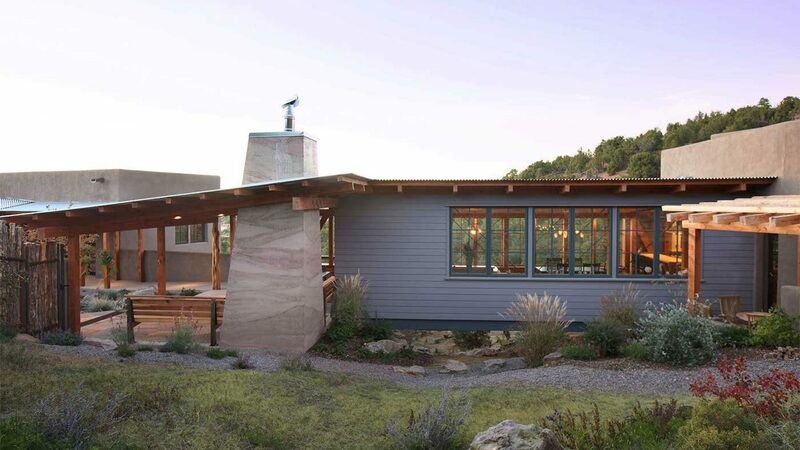 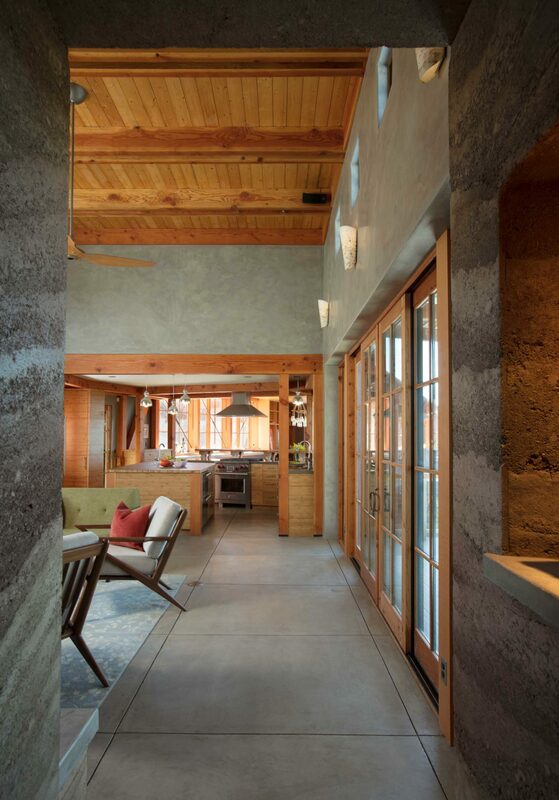 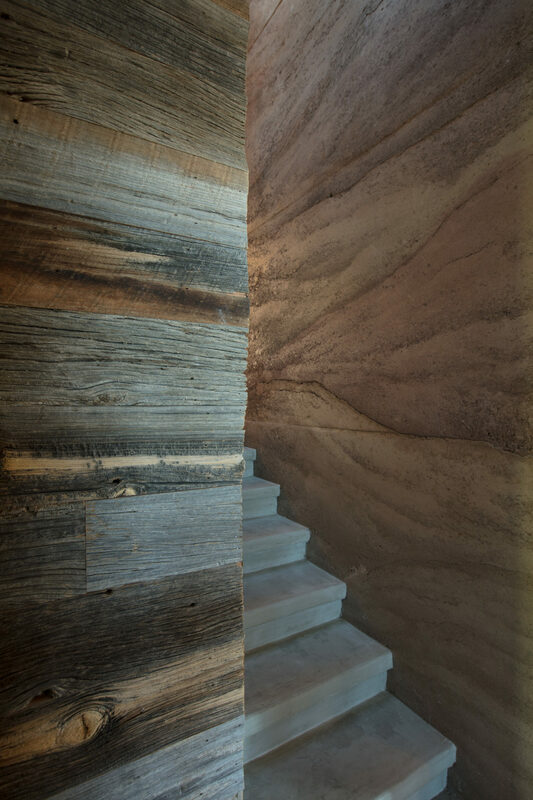 Located on the historic Eastside, this unique home features rammed earth walls and rustic contemporary design set against the dramatic backdrop of the Sangre de Cristo Mountains. 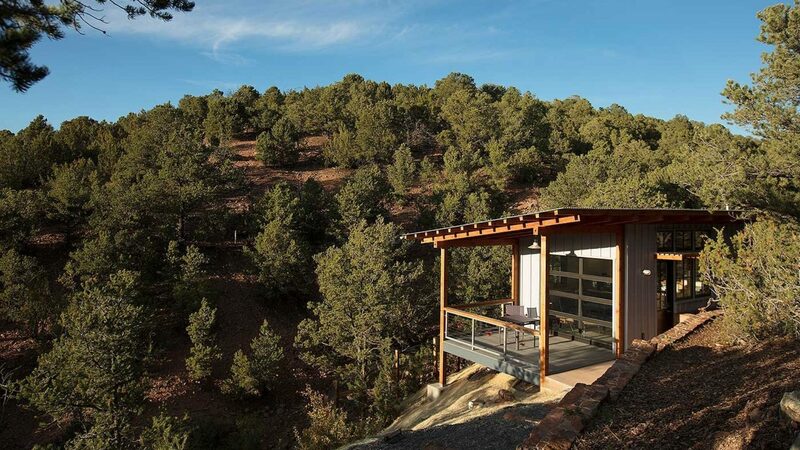 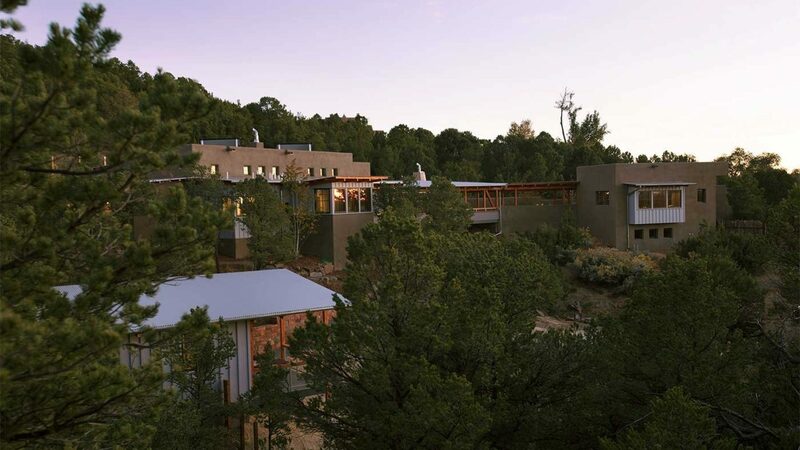 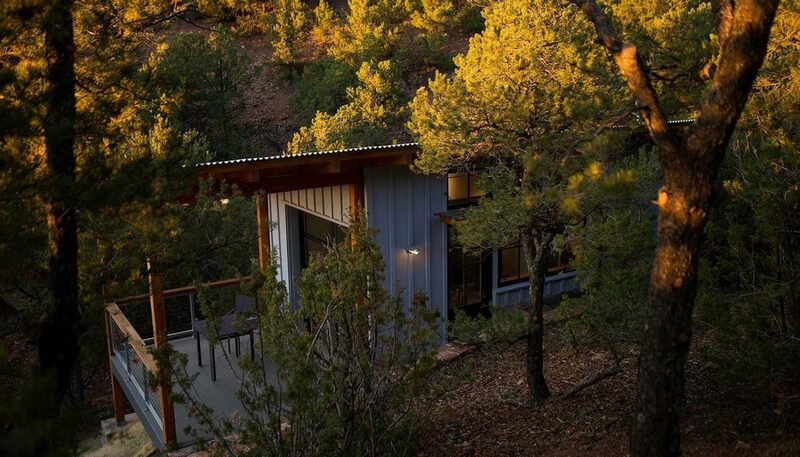 Perched high upon a rolling wooded site on historic Upper Canyon Road in Santa Fe, a portion of the house bridges an arroyo, floating high above the ground. 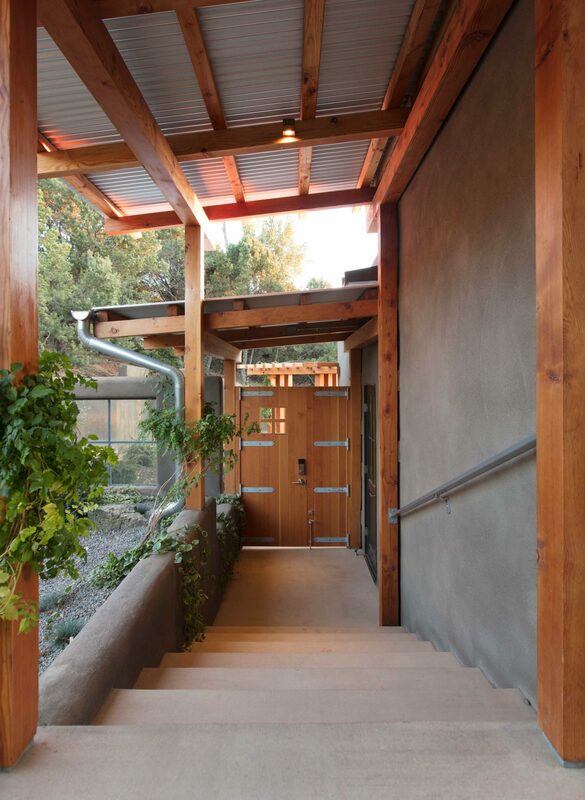 Metaphorically, the home bridges past and present: traditional construction with high performance building systems and modern spaces, with richly textured materials. 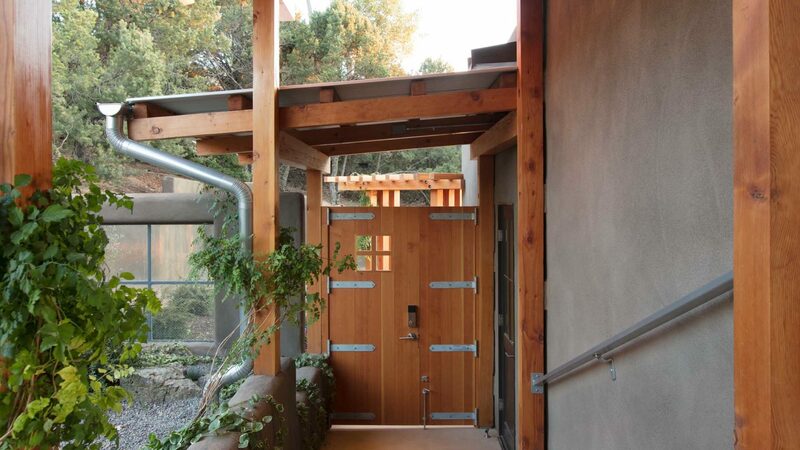 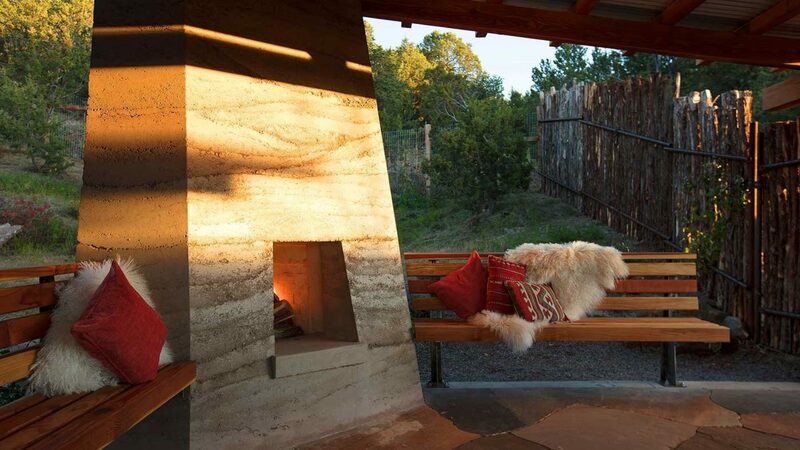 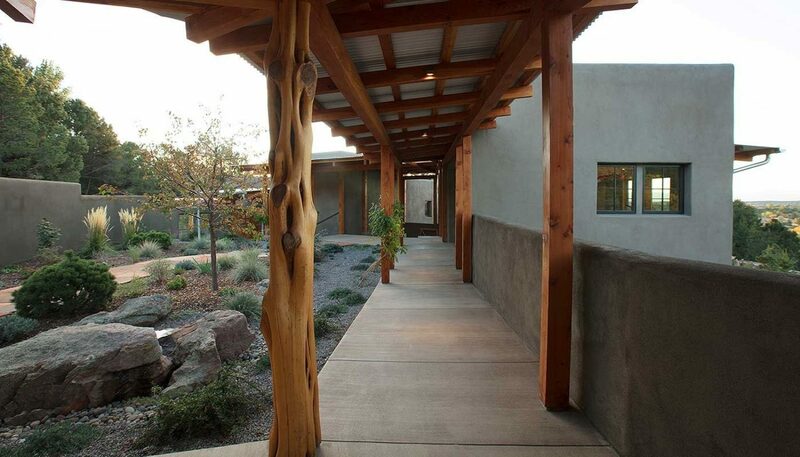 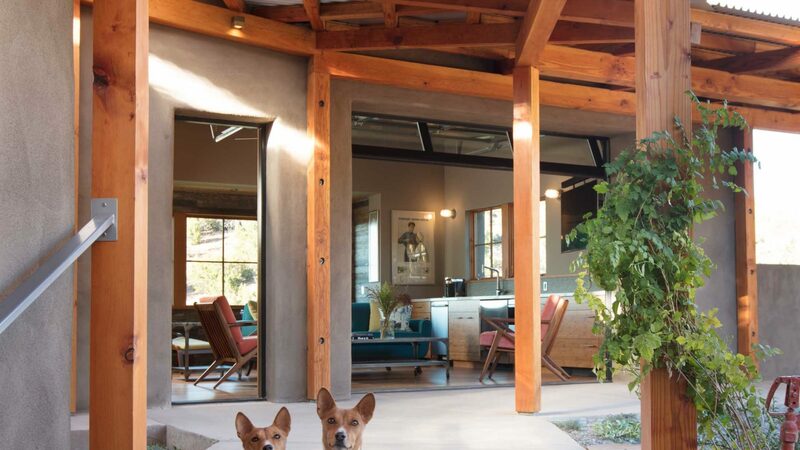 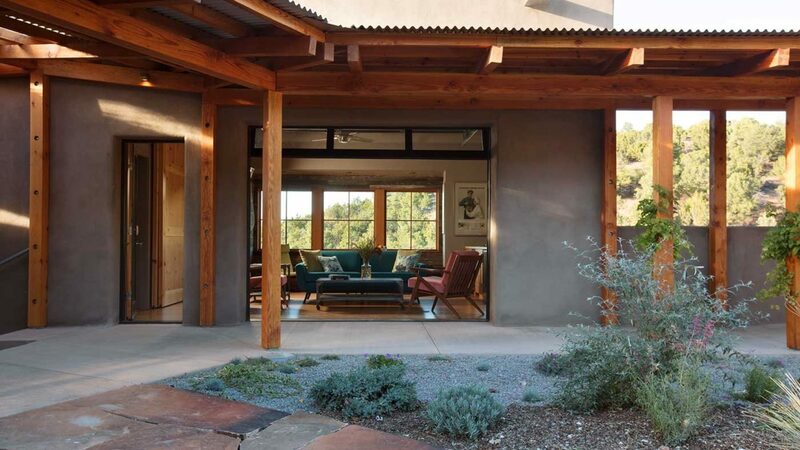 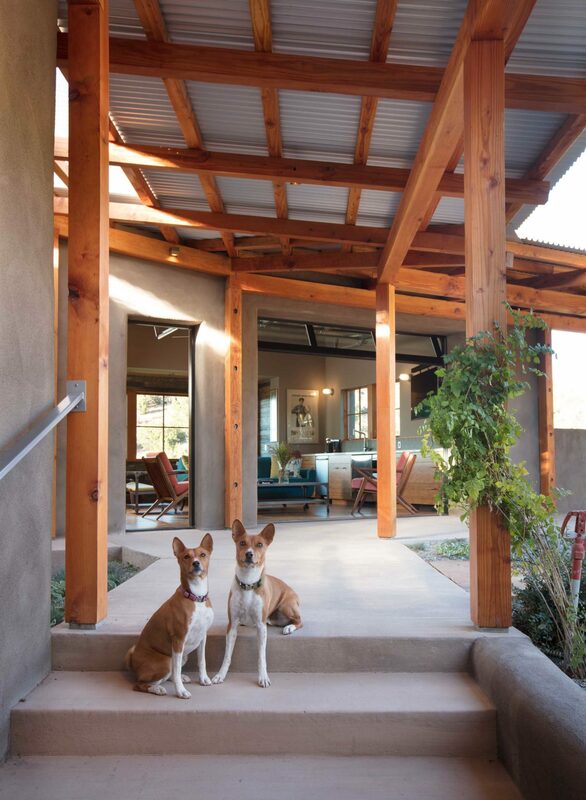 The covered outdoor entry sequence takes one through an enclosed courtyard, flanked by a detached guest casita and down a bridge-like passage opening to a cozy living space anchored by a rammed earth kiva fireplace. 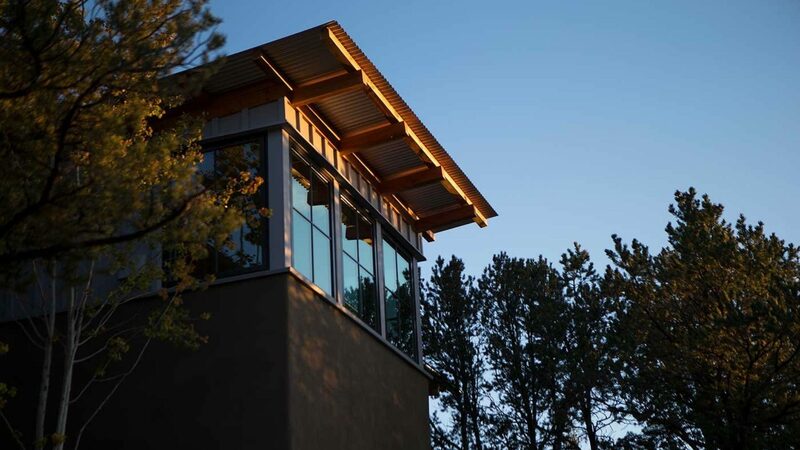 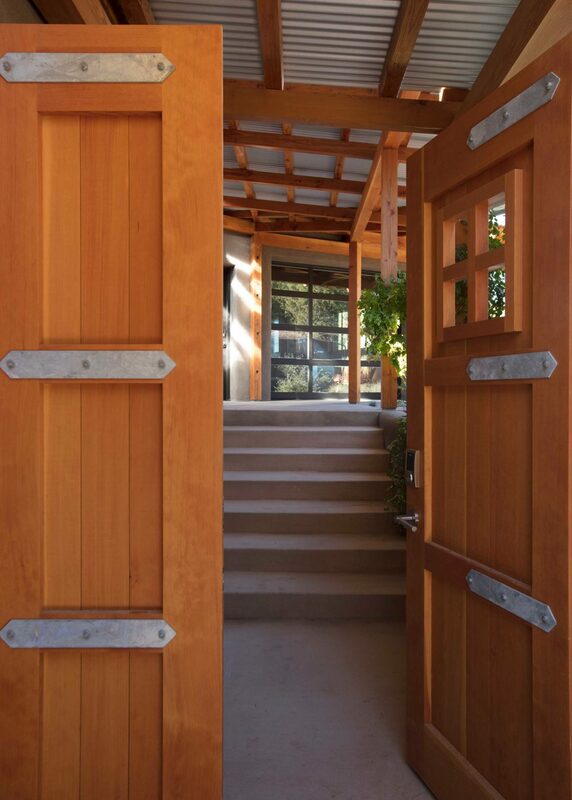 Immediately inside the home, you enter the dining room, which employs wood and cable stay trusses to span the arroyo, providing plenty of glass to soak in the majestic landscape. 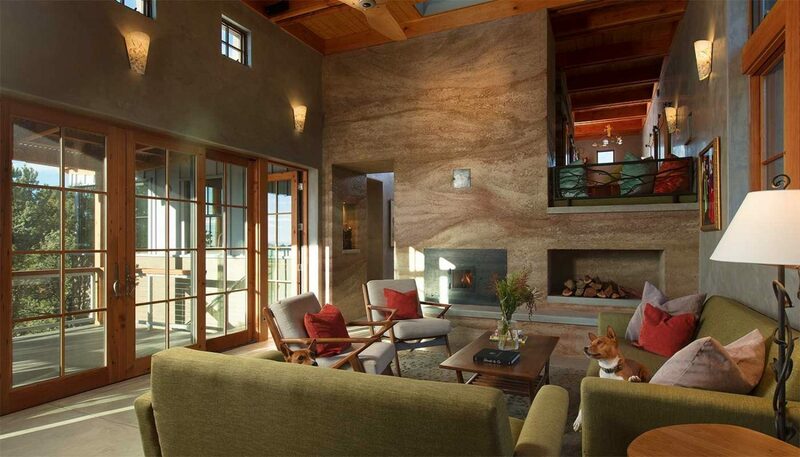 In contrast, the living room is firmly connected to the land with plastered ICF walls, concrete floors and a second custom rammed earth masonry heater fireplace, adding natural beauty, as well as thermal interior mass, increasing the home’s passive solar performance. 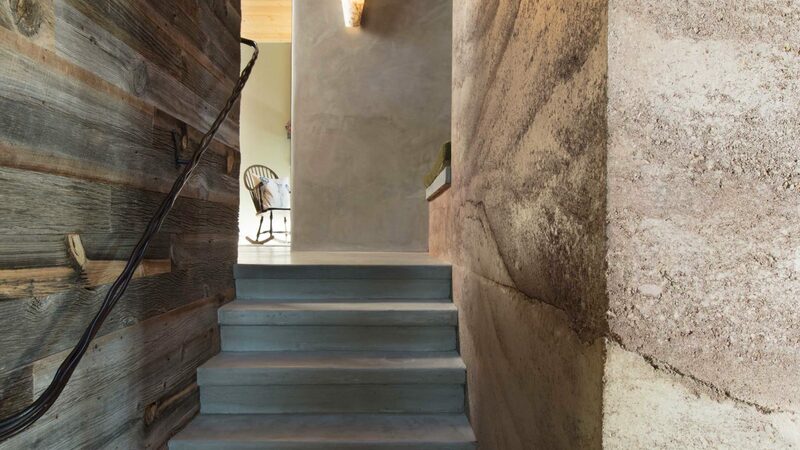 Deeply weathered salvaged wood accents are artistically incorporated into the interior core, along with locally harvested spruce in the ceilings. 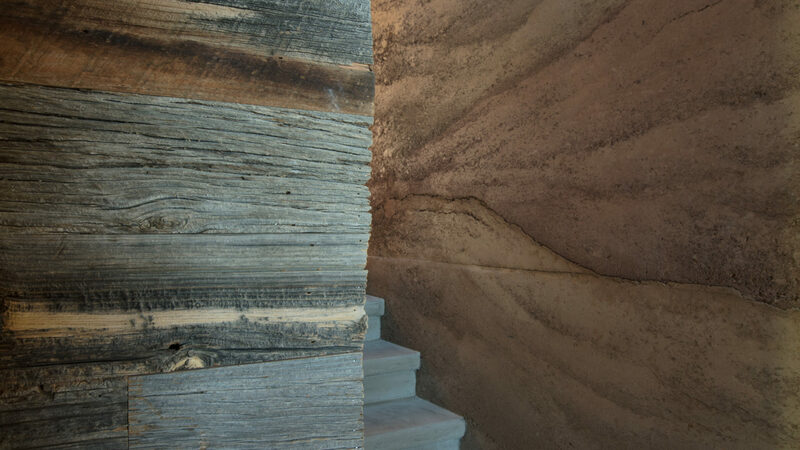 This masterpiece employs many energy and resource conserving features, providing a totally sustainable environment. 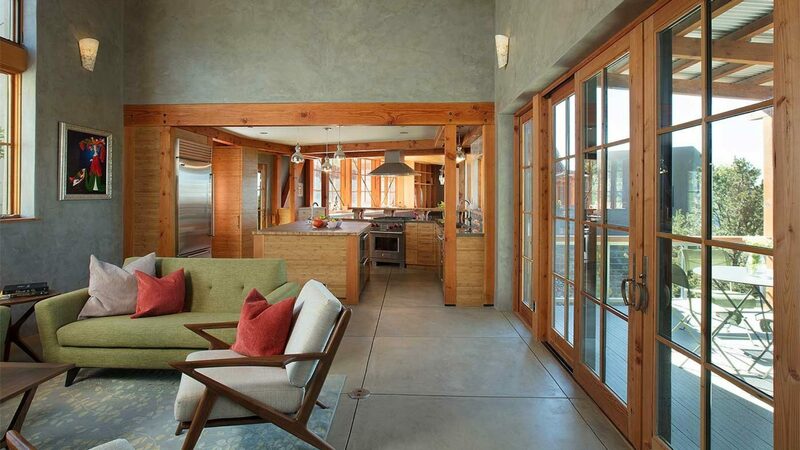 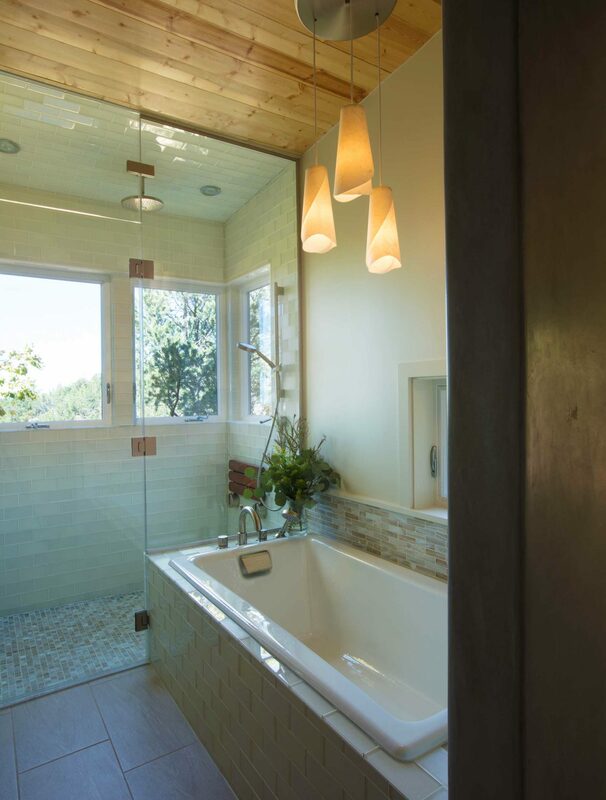 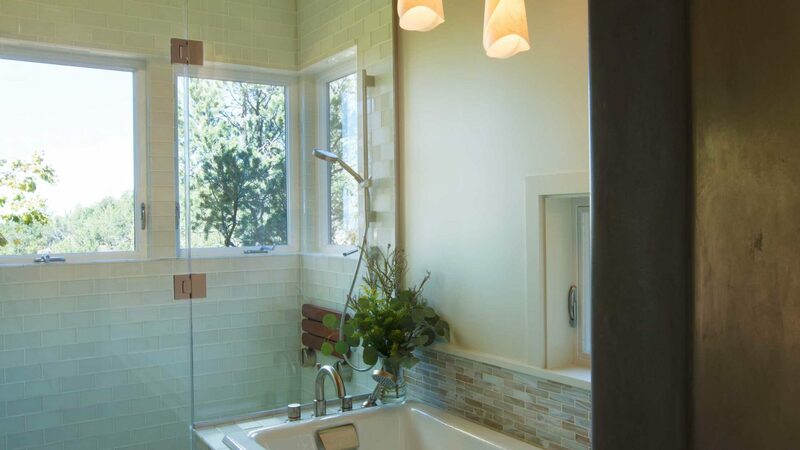 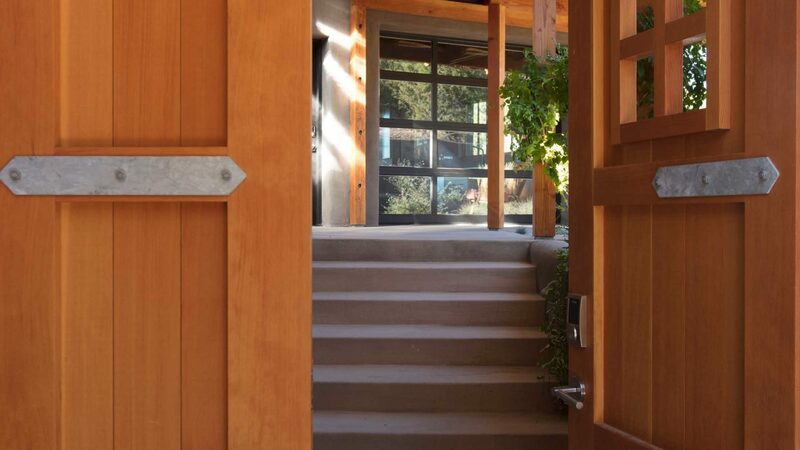 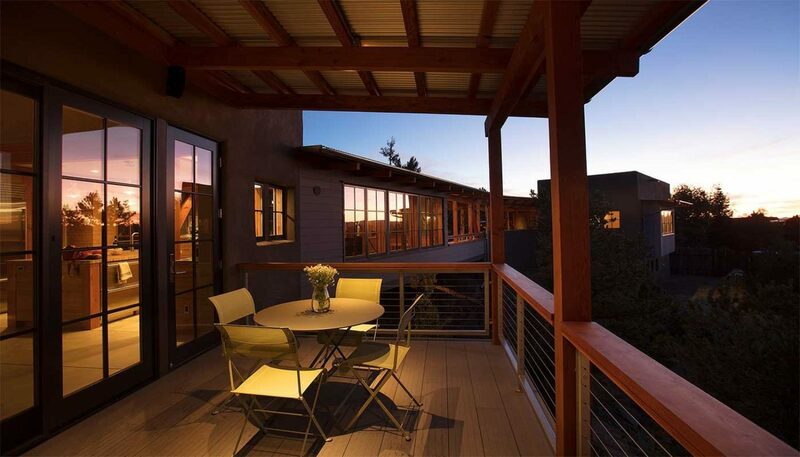 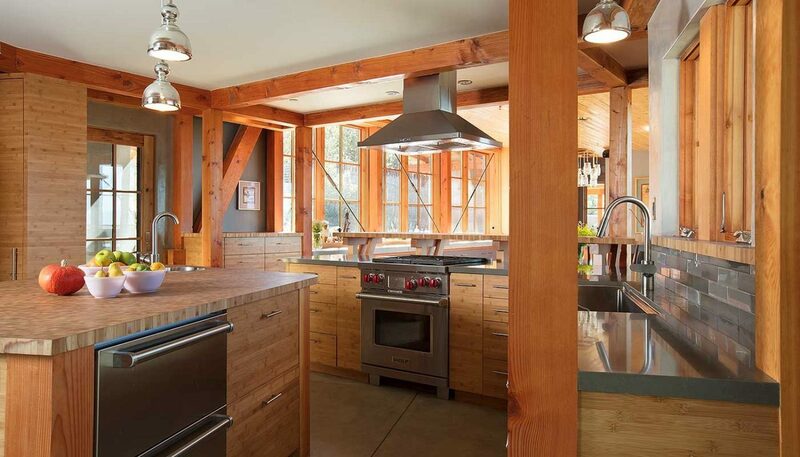 This home has received the ultimate Green Building seal of of approval being awarded the LEED Platinum Certification. 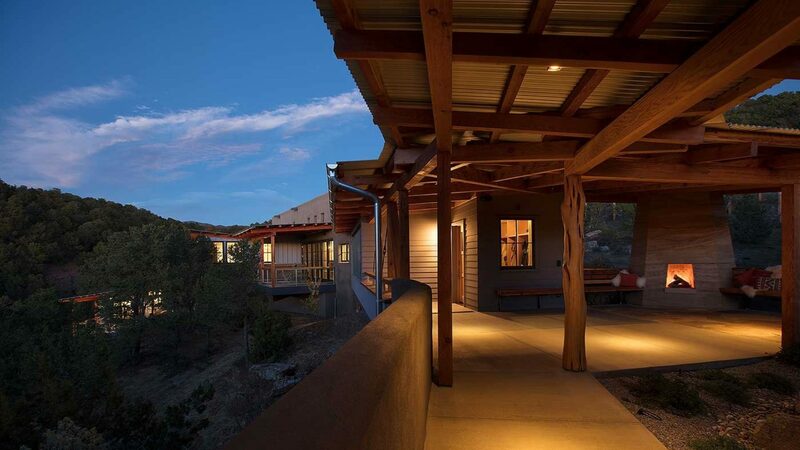 PublicationsWestern Art & Architecture Magazine – June/July 2018 – Connectivity and DelightTestimonialWe were thrilled to have Prull build our house. Ours was a challenging lot and design, but Prull was able to solve problems and create a house that is a joy to live in. 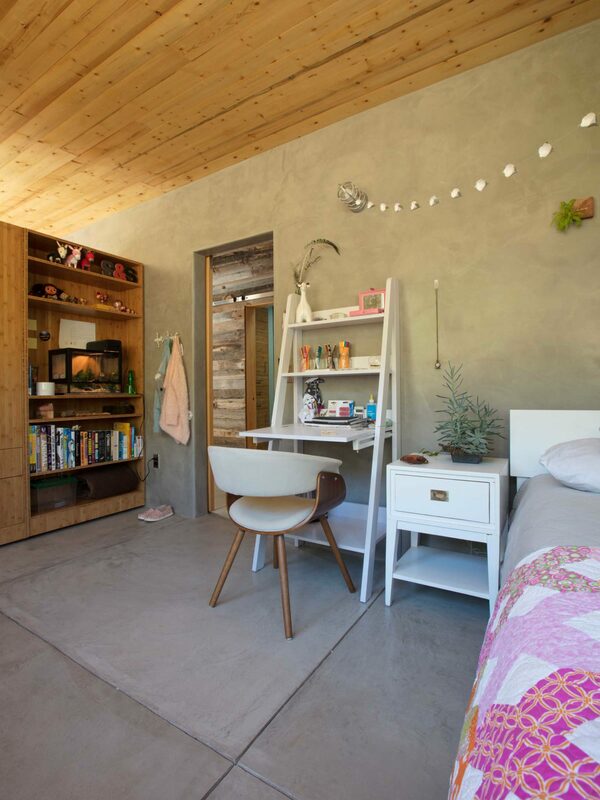 It's been in several magazines and books since, which is really fun.